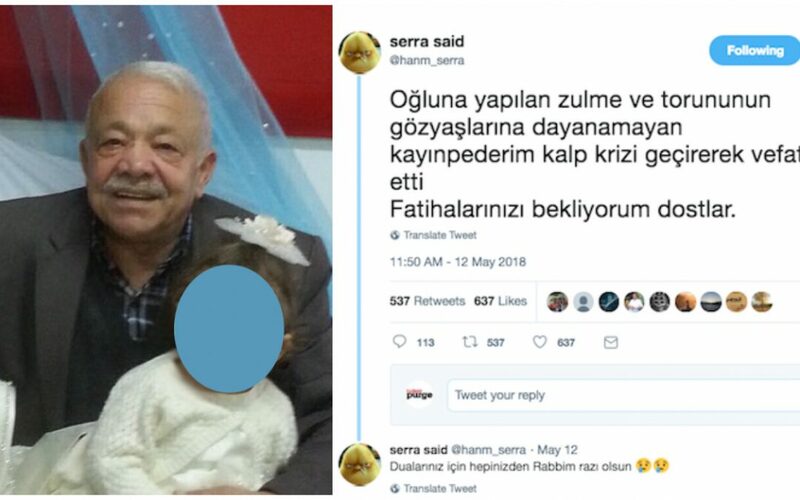 A 58-year-old Turkish man, identified as Mustafa A., has died of a heart attack just two days after his son, a teacher of religious culture who was jailed as part of the government’s post-coup crackdown, had his court hearing postponed, according to family members. “My father-in-law couldn’t stand to the persecution his son has been getting through and to the tears of his grandson, and passed away following a heart attack. I ask your prayers, my friends,” the Twitter account named Serra Said said on May 12. Speaking to Turkey Purge via Twitter messages on May 20, Said said her husband has been in pre-trial detention for 349 days. “My 11-year-old son burst into tears after his father’s hearing was postponed on May 10. His grandfather felt so said that he told his neighbors: ‘My grandson’s tears torn my heart out.’ Just two days later he suddenly fell to the ground at this home and passed away,” Said told Turkey Purge. Turkish government has detained 150,000 people and put in pre-trial detention 80,000 people under the State-of Emergency, declared after the July 15, 2016 failed coup. Arrestees include thousands of teachers, academics, businessmen, judges, doctors and many others from different backgrounds.